On December 20, 1966, Los Angeles businessmen Sam Schulman and Eugene V. Klein and a group of minority partners were awarded the NBA franchise for the city of Seattle. Schulman would serve as the active partner and head of team operations. He named the SuperSonics after Boeing’s recently awarded contract for the SST project, which was later canceled. 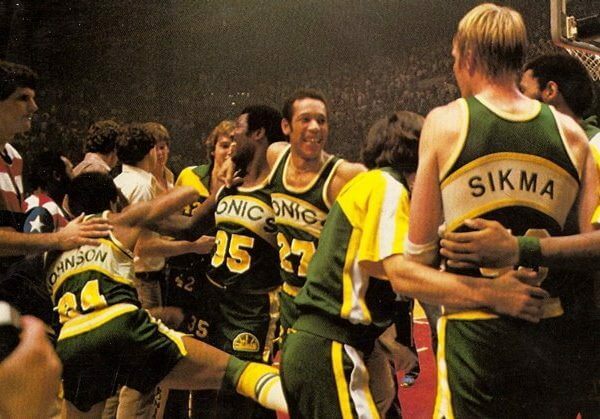 The SuperSonics were Seattle’s first major league sports franchise. Beginning play in October 1967, the SuperSonics were coached by Al Bianchi and featured All-Star guard Walt Hazzard and NBA All-Rookie Team members Bob Rule and Al Tucker. The expansion team stumbled out of the gates with a 144-116 loss in their first game, and finished the season with a 23-59 record. 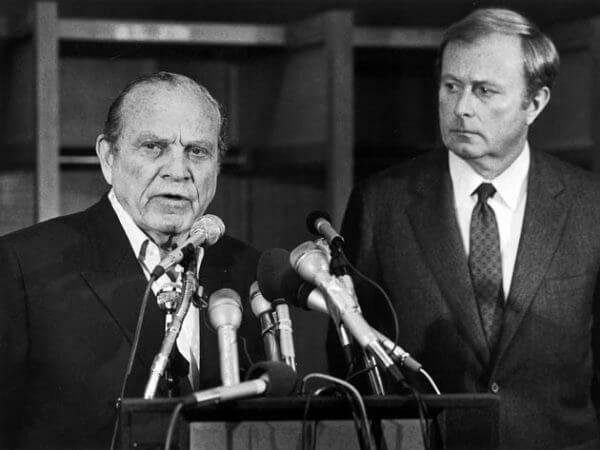 In October 1983, original team owner Sam Schulman sold the SuperSonics to Barry Ackerley, initiating a period of decline and mediocrity for the franchise. 1984 saw Fred Brown retire after playing 13 productive seasons, all with Seattle. His career reflected much of the SuperSonics’ history to that time, having been on the same team roster as Rule and Wilkens during his rookie season, playing a key role on Seattle’s first playoff teams, and being the team’s important sixth man during the championship series years. In recognition of his many contributions to the team, Brown’s number was retired in 1986. Lenny Wilkens left the organization following the 1984 – 1985 season, and when Jack Sikma was traded after the 1985 – 1986 season, the last remaining tie to the SuperSonics’ championship team (aside from trainer Frank Furtado) had been severed. Schultz is the former owner of the NBA’s Seattle SuperSonics. During his tenure as team owner, he was criticized for his naïveté and propensity to run the franchise as a business rather than a sports team. Schultz feuded with player Gary Payton, feeling that Payton disrespected him and the team by not showing up to the first day of training camp in 2002. 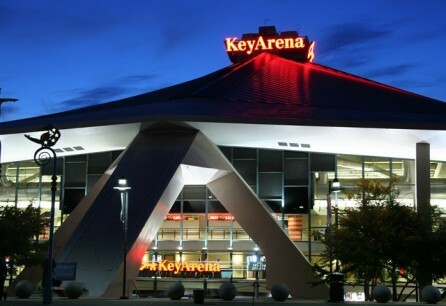 On July 18, 2006, Schultz sold the team to Clayton Bennett, chairman of the Professional Basketball Club LLC, an Oklahoma City ownership group, for $350 million, after having failed to convince the city of Seattle to provide public funding to build a new arena in the Greater Seattle area to replace KeyArena. At the time of the team’s sale, it was speculated that the new owners would move the team to their city some time after the 2006 – 2007 NBA season. 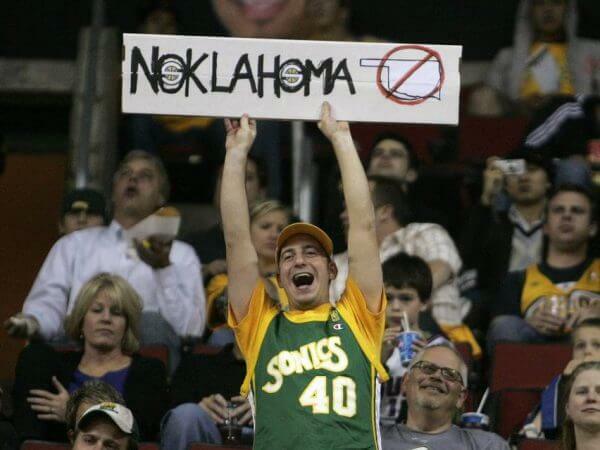 On July 2, 2008, the city of Seattle reached a settlement with the new ownership group and the SuperSonics moved to Oklahoma City and became the Thunder for the 2008 – 2009 NBA season. The sale to the out-of-state owners considerably damaged Schultz’s popularity in Seattle. In a local newspaper poll, Schultz was judged “most responsible” for the team leaving the city. Before the city of Seattle settled with the Oklahoma City ownership group, Schultz filed a lawsuit against Bennett in April 2008 to rescind the July 2006 sale based on what Schultz claimed was fraud and intentional misrepresentation. However, Schultz dropped the lawsuit in August 2008. When Bennett purchased the SuperSonics and its sister franchise in the WNBA, the Seattle Storm, for $350 million, he agreed to a stipulation that he would make a “good-faith best effort” for one year to keep both teams in Seattle. From 2001 to 2006, Starbucks CEO Howard Schultz was the majority owner of the team, along with 58 partners or minor owners, as part of the Basketball Club of Seattle LLP. On July 18, 2006, Schultz sold the SuperSonics and its sister team, the Women’s National Basketball Association (WNBA)’s Seattle Storm, to the Professional Basketball Club LLC (PBC), a group of businessmen from Oklahoma City for $350 million. The team relocated to Oklahoma City in 2008, and now plays as the Oklahoma City Thunder. Kevin Durant, who was drafted by the SuperSonics in 2007. After failing to persuade local governments to fund a $500 million arena complex in the Seattle suburb of Renton, Bennett’s group notified the National Basketball Association (NBA) that it intended to move the team to Oklahoma City and requested arbitration with the city of Seattle to be released from the Sonics’ lease with KeyArena. When the request was rejected by a judge, Seattle sued Bennett’s group to enforce the lease that required the team to play in KeyArena through 2010. The Seattle SuperSonics, commonly known as the Sonics, were an American professional basketball team based in Seattle, Washington. 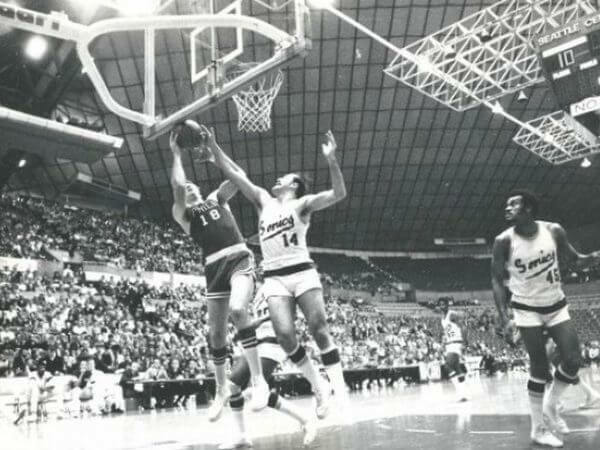 They played in the Pacific and Northwest Divisions of the National Basketball Association (NBA) from 1967 until 2008. After the 2007 – 2008 season ended, the team relocated to Oklahoma City, Oklahoma, and now plays as the Oklahoma City Thunder. SuperSonics – The SuperSonics had been named for an airplane called the (SST) SuperSonic Transport project. The plane was to be built by Boeing, which had a large plant in the Seattle area. However, the project was later canceled. Who is the greatest Seattle Supersonics?